This is Steve once more from celtahelper.com, with another very common question. I keep getting asked this by so many people so I thought I’d address it on here and it goes something like this. What are the job prospects for non-native speakers with a CELTA certificate? There are several key features. It depends on where you can get a work visa or a work permit and your previous experience. Is it teaching? Is it in a related industry? Do you want to go into English for specific purposes and so on? There are certain markets demand for native speakers and you’ll see this in job adverts. For example, countries like Korea or Indonesia state that “By law, we can only offer work visas to …” and it doesn’t actually say native speakers. I think it says citizens of Australia, New Zealand, Canada, etc, all the English as a first language countries. So the first thing really, if you want to work abroad is to have a look at the job adverts. It sounds strange to say this but so many people don’t actually do it first! For job adverts, a good place to go is tefl.com and I often mention this because that’s where I got my first few TEFL jobs after my CELTA certificate. It’s all laid out for you so you don’t need to do too much hunting around with that one even if it hasn’t got the exact jobs you want. It’s a good place to start. Great place to have a look at for a nice, clear breakdown. 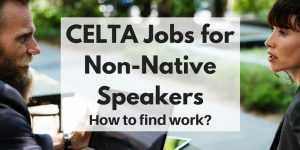 As I was saying earlier about CELTA jobs for non-native speakers being slightly different, however the door isn’t closed to non-native speakers in just about any country because they really need lots of English language teachers, especially in Asia. For example, my friend’s wife has worked in a school in China. She’s not a native speaker. She’s not from any of the countries we listed but she got a job because she was already in the country. Admittedly, her husband was working in the school but she got the job because she was living there. So if you are able to travel to certain countries or are situated in another country and you want to work there, just start asking around and see what is available. Who knows there might be a very different story when you’re actually there as opposed to if you’re in your own country or in a different place! Don’t think that the door is closed – you have to knock first! It can be done and I’ve seen people in the biggest CELTA Facebook group talking about getting jobs in China, for example, as a non-native speaker, which again, appears impossible if you only look at the exact job adverts. There are a lot of job prospects out there. Do your research before you take the CELTA course. If you’re looking to work abroad, then make sure you know what is available to you because there’s no point of taking it if you can’t do what you want. It will cost you a lot of money so just have a look first. I hope that was useful for you. If you have any more questions, you can leave them on celtahelper.com or on my Facebook page: facebook.com/celtahelper. What kind of jobs can I get with a CELTA certificate? May 2, 2017 … Here, I’ve made a guide to help you decide on the best CELTA course for you and your needs. Save yourself the time and go through my step-by-step process NOW! Do you have a CELTA question for me?